No single food will simply make you smart. One can only wish that improving brain skills were quite so easy! But the right diet can provide the best environment for your brain to reach its potential. Without enough healthy foods, your brain is like a car without petrol. Perhaps even more positive is that if you already eat a balanced diet, adding in some foods thought to specifically support good brain skills can make all the difference. Essential fatty acids play a key role in a healthy brain. One of the best foods you can choose to ensure sufficient essential fatty acids in the diet is wild salmon. It also has good quality protein and is low in saturated fats. 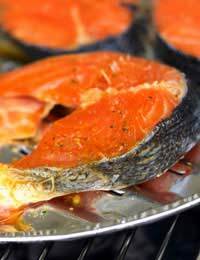 Eating enough essential fatty acids in foods such as salmon is thought to help support brain matter, neurotransmitters and memory. One study even suggested that mood could be improved. Protein is needed for many functions in the body but one in particular is important – brain functioning. Protein provides the building blocks for life, helping you with a healthy, normal messaging system. Your central nervous system needs protein to keep your brain running smoothly. While some foods are incomplete proteins, others have all the essential fatty acids. Including foods such as salmon as mentioned above or meats, poultry and eggs can help your body get all the complete proteins that it needs for a healthy central nervous system. B-vitamins work in synergy to support a healthy brain. These vitamins are involved in neurotransmitter functioning, which is how your brain communicates and passes messages. Neurotransmitters are also important in regulating your mood. Researchers have studied how antioxidants can help brain functioning. Antioxidants include a number of nutrients such as vitamin C, vitamin E and coenzyme Q10. These nutrients are thought to help slow down the ageing process of the brain and may play a role in helping memory and mental acuity. Although some people take antioxidant supplements, it's best to obtain antioxidants through food sources. This way, you get the cofactors and other nutrients important to absorbing and utilising the antioxidants. You can find antioxidants in a number of nutritious foods. Try adding in blueberries, green tea and even dark chocolate. Generally as a rule, the wider variety of fruits and vegetables you consume each day, the more likely it is that you are getting enough antioxidants in your diet. Choline is found in egg yolks and is thought to help brain health. It is concentrated in the egg yolk – ironically, many people seem to still discard the yolk and eat only whites, thinking the whites to be healthier. Eating egg yolks provides choline to possibly reduce age-related mental decline and even could offer some degree of protection against Alzheimer's disease. Remember that just eating these nutritious foods is not enough. Now that you have powered up your body, you can participate in activities and strategies that improve your memory and other brain skills to help you get ahead in life.